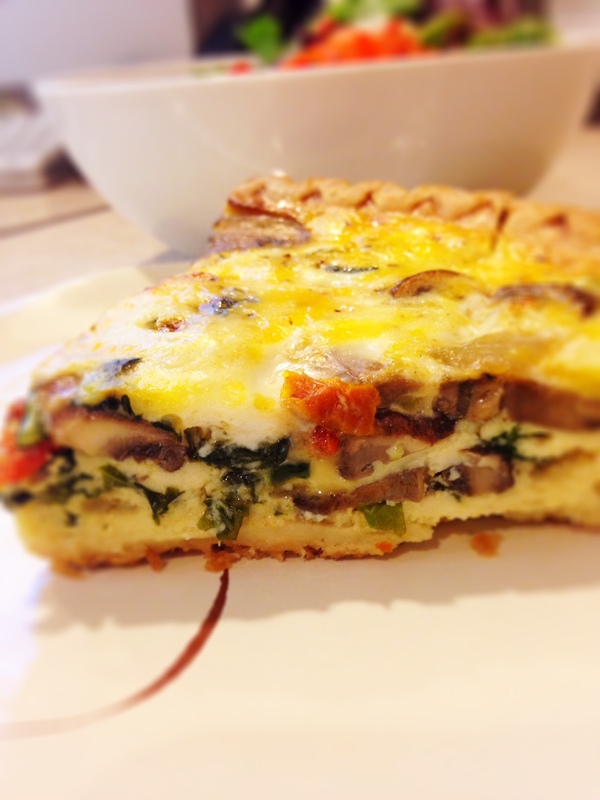 This is my favorite quiche recipe. It hasn’t failed me yet and I’ve served it countless times with excellent results. I’ve had this recipe for years but adapted it along the way. Originally it calls for sausage, which I still make here and there, but I prefer the sweet, caramelized taste of leeks, pungent sun-dried tomatoes, meaty mushrooms and mild spinach in mine. I usually just throw in whatever I have that day and it turns out delicious every time. This time I threw in some kale in addition to the spinach, but I could see adding zucchini, squash, roasted fresh tomatoes, peppers, roasted potatoes, broccoli….you get the idea. Whatever you have in your fridge is fair game. Preheat oven to 375 degrees. Saute leeks on the stove top in a little olive oil until they begin to caramelize. Add a tiny splash of salt and pepper. Add in the mushrooms and cook until they begin to release some of their juices and brown up a bit. Next, add in the chopped sun-dried tomatoes (I use the Trader Joe’s brand that is packed in olive oil so that I don’t need to let them soak and soften up a bit) and saute for a couple minutes. Lastly, add in your greens and cook until lightly wilted. Turn off the heat and let rest. While your veggies are cooling down a bit, it’s time to prepare the egg mixture. In a large bowl, crack your eggs, add the milk, salt and pepper and whisk everything together. Then add in the cheese and incorporate. Once everything is mixed together it’s time to assemble! Put your pie crust on a sheet pan (it just makes the transport to the oven that much easier). Fill first with all your cooked vegetables. Then, pour your egg mixture over. Set in the oven and cook for about 30-40 minutes until the top is puffed, set and a tad golden brown. Let stand for about 5 minutes before cutting to give everything time to set up. Yum! 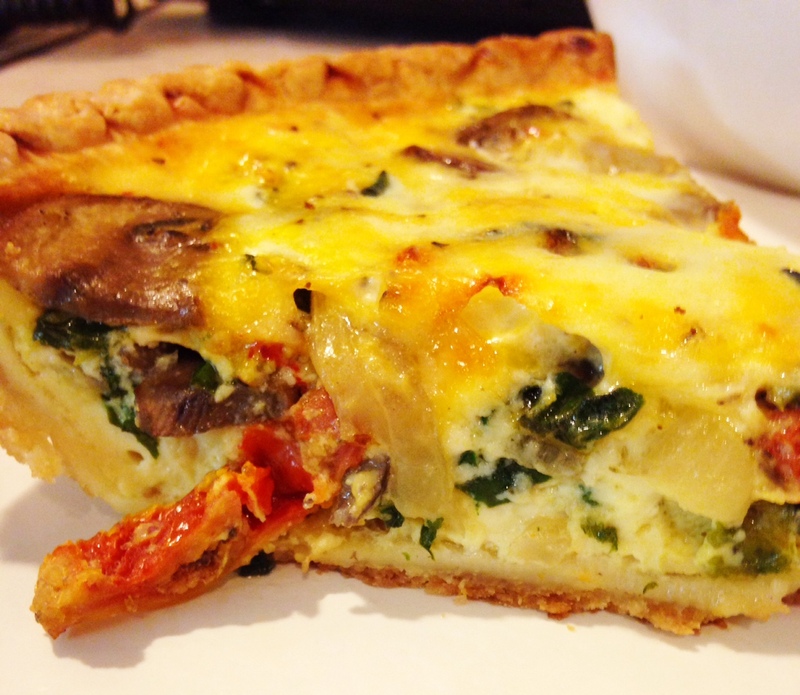 This recipe is so easy and makes for great leftovers. I took some to work today, paired with a salad it made the perfect meal. Enjoy! 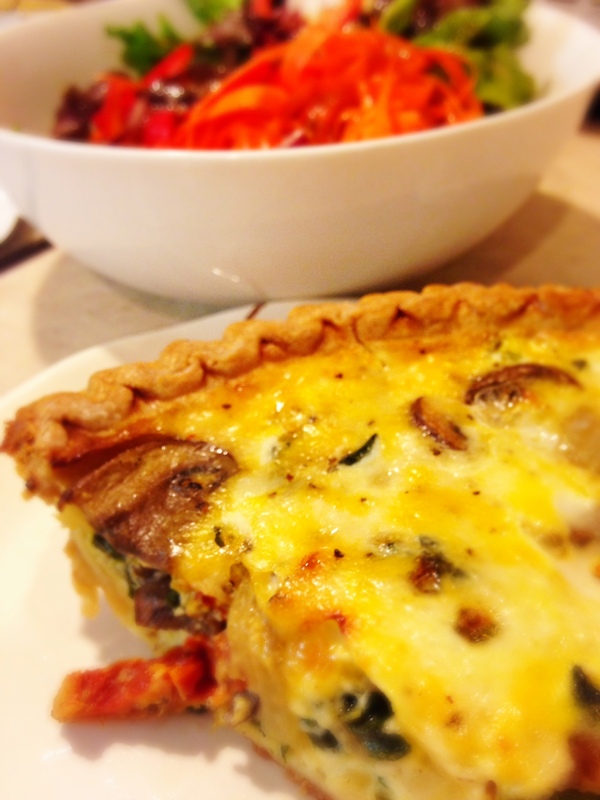 I need more quiche in my life! Trying this soon. Your husband is one lucky man. That looks DEE-licious.